If you haven't had a chance to get an SSL certificate and enable HTTPS on your site then now is a good time to do it. Google recently announced that it will label non-HTTPS websites unsafe in the Chrome browser. It’s a little acronym that makes a big difference! In layman's terms, this means that your site communicates with the rest of the Internet under a secure and encrypted line. This makes it far more difficult to “snoop” and steal information. It’s also something that Google thinks is incredibly important, which is why it’s becoming increasingly important that you install an SSL certificate on your site. How do you know if you have SSL installed? Look up at the navigation bar – see a little padlock or the “https” at the front of the URL? That symbolizes that an SSL certificate has been installed, meaning you can trust that information is being securely stored. Take mine for example. I’ve got full SSL in place on my website. To check if your site is secure, go to SSL Shopper and type in your domain. Google is ramping up their efforts to secure the Internet and has started naming and shaming all websites that aren't encrypted with an SSL certificate. Make sure you have an SSL certificate for your site so you don’t get penalized by Google. 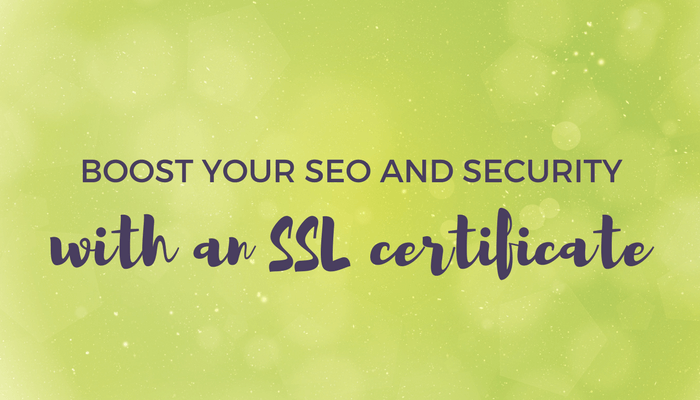 Give your site a nice boost in both SEO and security with an SSL certificate. The padlock and https://. This means your info is being encrypted and that visitors can interact with your site without worry. If you want to talk to someone about getting your site 100% encrypted then drop me a line at christina@christinapetrie.com.